Ye be landlubbers! I be the real buccaneer, matey! 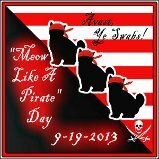 I be the baddest buccaneer on the Black Paw pirate ship! To see me is to fear me! No one crosses Bloody Prudentilla Kidd! Arrrrrr! Welcome on th' poop deck th' Black Paw scurvy pirate ship. Now ye'll be me prisoner! Hand me me grub dish 'n then spit shine me litter box. Move it, Woman! Arrr Matey, theese is the purr-fect pirate name for ye! Yikes! You're a frightening pirate lady! In a good way! Now we want our wench to spit-shine our litter box, too! Keisha you make a pawsome pirate. Be careful you don't get lots of poop on the poop deck. Shiver me timbers and yo ho ho and a bottle of milk, have a tremendous Thursday. What a pawesome pirate name, CK -- we mean Prudentilla! Arrr Cap'tain, ye be an awsome scurvy pirate ! Be careful wit' th' poop thin' all th'same. Arr we be lookin' for pirate like thee - come join us and set sail for nip treasures. CK, you are such a beautiful lady pirate! Haha, spit shine litter box! Your pirate name and description fits you well! Nice to see you toning it down a bit for pirate day, CK!! Hi-ho bucko, ye're fierce pirate lady! We be happy t' set sail with you. We're makin' a brief port o'call to MEARRRRRGH back atcha! 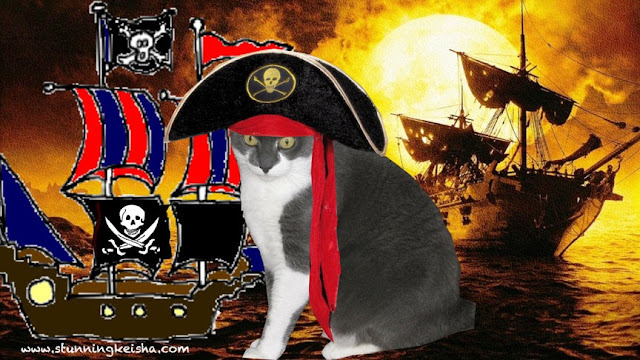 You are indeed Pirate Purrfect CK! Will you make TW walk the plank CK?? well, there's 'poop deck' and then there's 'poop box'...I assume you don't want the deck filled up like the box...right CK?? And I think your ship is the baddest ship on the seas...mrreoowwwww! Avast, CK! Ye be making a fine and fearsome pirate, indeed! We are proud and honored to join ye, sailing the high seas and plundering for treasure! Ayeeeee CK we're all scared and we think you made a very fierce pirate! love it! 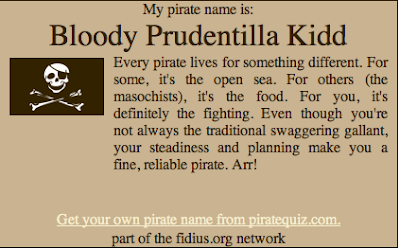 We did the Pirate name thing I think last year, forgot to use it again! Arrrrgh! Ye be a fine pirate, Bloody. We be Mad Redbeard Wally, Evil Necksnapper Ernie and the Bloody Mistress of Death Zoey. We catch th' early evenin' tide 'bout 5 bells to ye Olde Soton town, ye want to come along! Now that be a grand idea to use th' humans on th' ships as our servants! Human!!!!! We love the name. And evidently it suits you. We'll hand over our nip mice without a battle. Btu we hope ye got a drop o rum left. Ahoy there Matey! May we swing aboard to party with you? We've got grog! You know, I really like using the Talk-Like-A-Pirate day to order the Humans around. I spent the day watching Katie I work on her boat. And then I ate some fur. It was weird. Come see. Arrrr CK!!!!! Did you pass on a bitey today? MOL - hope your spit-shined litter box sparkles when she's done! I had to go take the pirate name quiz. I'm "Captain Anne Rackham" - Even though there's no legal rank on a pirate ship, everyone recognizes you're the one in charge. Still think your name is way cooler! CK, you make the most impressive Pirate out there in the CB! How do you like Spitty watching me work so hard, all exhausted like that? I'm just a little bit skerred right now. And Waffles is shivering in his timbers. You look furry fierceful as a Pirate , CK !